Available blue, black , camo, green, khaki white, orange, pink, purple and red, these custom visor caps feature a seamed front panel without Buckram, six embroidered eyelets with matching stitching color, six rows of stitching on visor, pro stick on crown, matching fabric under visor, color sweatband, adjustable hook and loop closure. Personalized with your graphics or artwork available free at our library of clipart and fonts, these embroidered visor caps can also be printed with your logo in time for your promotional events. 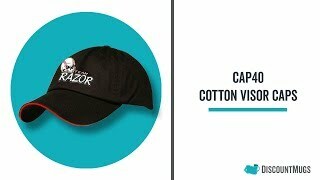 Ideal for outing events, trade shows, conventions, corporate events and other occasions of the like, our 100% cotton visor caps can be order in wholesale amounts that save you tons. Save with our cheap prices and place your order today. Simply follow the prompts on our easy to use online interface and D-lab tools and contact our customer service team should you have questions regarding the quality of our items. A proof of your custom visor caps can be provided upon request. I ordered caps for our group and they did an embroidered logo on them. They are AMAZING!! Everyone loves the caps and the logo. The hats turned out much nicer than shown in the proofs. The embroidery was much bigger and very nice and the caps are very nice quality! Really look great!nI am hoping the matching shirts will look as good! Please continue being that company that delivers a great product.nI really like this website and how you have handled my order. nThank you. This is a great hat. Big enough,and adjustable and the embroidery is LARGE and nice! The hats were perfect! Great quality and fast delivery. Everyone loves them. Thank you!! !